GEORGETOWN - “2017 holds great promise for us to advance our integration process which can only be possible through the involvement and participation of all. Let us resolve to play our part in strengthening our Caribbean Community and to making regional unity a living, breathing experience,” said president of Guyana, Brigadier David Granger, the incoming chairman of CARICOM. 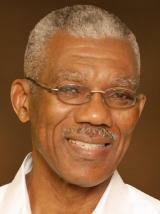 In a New Year message, Granger – who will chair the Community for six months from January 1, 2017 – placed people at the centre of the integration movement, and pointed to the actions that were being taken to ensure that they were secure and safe, and were equipped for the 21st century economy and society. “This year marks the mid-point of our Five-Year Strategic Plan for the period 2015-2019, a foundational element in the Community’s reform process. That process is geared towards ensuring that our people feel the impact of the integration movement in their daily lives. Integration is not merely about systems and institutions. It is mostly about people,” he said in the message. Granger also took the opportunity to express gratitude to Prime Minister Roosevelt Skerrit who chaired the Community for the past six months. “As Guyana assumes the chair of CARICOM, I would like to thank the Honourable Roosevelt Skerrit, the prime minister of Dominica for his able leadership of the Community for the past six months. As I receive this baton, I will continue to guide our Community in the path of sustainable development which serves the interest of all its people,” Granger said.